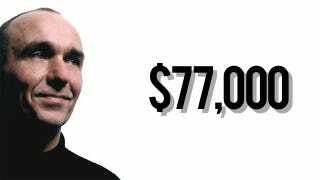 Will You Let Peter Molyneux Peek in Your Brain and Sell You a $77,000 Chisel? Game designer Peter Molyneux is a man with ideas—big ideas. And with his new startup, 22Cans, that isn't stopping. "Human beings can read emotion in faces down to a level of fidelity we can't even dream of in games at the moment," Molyneux recently told New Scientist. That, Molyneux thinks, he can change. And change it thanks to the power of social media. Molyneux aims to bottle personal data shared via social media to tap into what players like and then create characters based on those preferences. In short, Molyneux wants to explore into your psyche to make games you can relate with on an emotional level like never before. To do this, Molyneux is launching 22 experiments designed to tap the psyche of social media users. That data will then be used in the creation of his upcoming game, which he plans to release two years from now. According to New Scientist, the first experiment is called "Curiosity", and it puts you in a virtual room. In it, there's a solitary black cube. Tap on it, and the cube fractures. Everyone playing the game at the same time taps on the same cube, causing more and more fractures to appear. After a large number of taps, it will finally open, revealing something that is "truly amazing, absolutely unique". However, only the player who gets the final tap will get to see what's inside it. "This is not a money-making exercise; it is a test about the psychology of monetization." What 22Cans wants to do is see how the news of what's inside the cube spreads—how the person will prove he or she saw what's inside. Moreover, Molyneux plans on allowing players to purchase in game gear to strengthen their tapping. For example, you can buy iron chisel (priced at 59 pence), which is 10 times more powerful than simply tapping. Or you can buy a one-of-a-kind diamond chisel. It's 100,000 times more powerful and priced at £50,000 (US$77,000). "It's an insane amount of money," said Molyneux, adding, "This is not a money-making exercise; it is a test about the psychology of monetization." Molyneux hopes that this experiment—and the other 21 he has planned—will help him better understand players. In turn, that will help him make a game that can connect with them in a deeper, more meaningful way. "Saying, 'Let me look at your Twitter feed', is not enough—I've got to make people want to give it up." But will they? In a few weeks when the first experiment launches, Molyneux will see if gamers are will to "give it up"—or even shell out £50,000 for a virtual chisel.